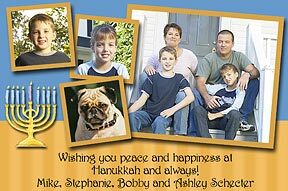 Photo Hanukkah Cards - Personalized Chanukah Photo Cards ! 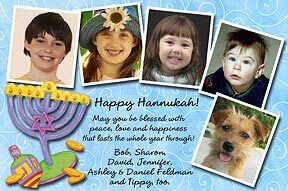 Our custom photo Hanukkah cards are unique, personalized designs. 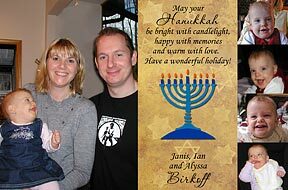 We take several of your photos to create outstanding, one-of-a-kind Chanukah photo cards especially for you. These photo Hanukkah cards are so beautiful, brilliant, and unusual that your friends and relatives will want to frame them or put them in scrapbooks! Our artists have created original designs for our photo Hanukkah cards, that you won't find anywhere else. 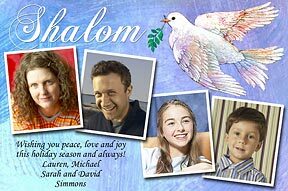 Why struggle to get that one perfect family photo for this year's Hanukkah photo cards, when you can send us 2, 3 or more favorite photos to capture your family's personality for a memorable holiday greeting?! These photo Hanukkah cards are stunning, archival quality, real photographs, with accompanying envelopes, and guaranteed to be the talk of the holiday season! New Rainbow Multi Photo Hanukkah Cards © Send us 7 of your favorite photos with your message and personalization. New Gold Star 5-Photos Hanukkah Cards ©Send us 5 of your favorite photos with your message and personalization. (Please indicate which photo you want to us to use for the large, featured photo). New Festive Scrapbook Page Hanukkah Cards ©Send us 4 of your favorite photos with your message and personalization. (Can also be made with 3 photos) New Shalom Photo Chanukah Cards ©Send us 4 of your favorite photos with your message and personalization. New A Very Happy Chanukah Photo Holiday Cards ©Send us 5 of your favorite photos with your message and personalization. New Classic Photo Hanukkah Cards ©Send us 4 of your favorite photos with your message and personalization. (Please indicate which photo you want to us to use for the large, featured photo).